Everyone’s a winner when you visit our shop in Lower High Street, Stourbridge. We are fortunate to have some fantastic supporters who donate new or good quality items such as clothing (often with High Street and designer labels still attached), gifts, jewellery, books and household items, so there are always plenty of bargains to be found. Word has got around resulting in our stock changing rapidly so there’s always the prospect of discovering something special! Women’s clothing, shoes and handbags are always popular but we also stock plenty of menswear and children’s sizes too. Toys, CDs & DVDs, glassware and all sorts of unusual odds and ends as well as smaller items of furniture can also be found. It’s always worth browsing our £1 rail and our brand new giftware, stationery and card range are great, especially if you’re a cat lover or know someone who is! But it’s also nice to know that while you are saving money you’re also supporting the cats in our care. With a waiting list of up to 200 animals who also need our help we are extremely grateful to those who donate goods as well as those who come and buy them. 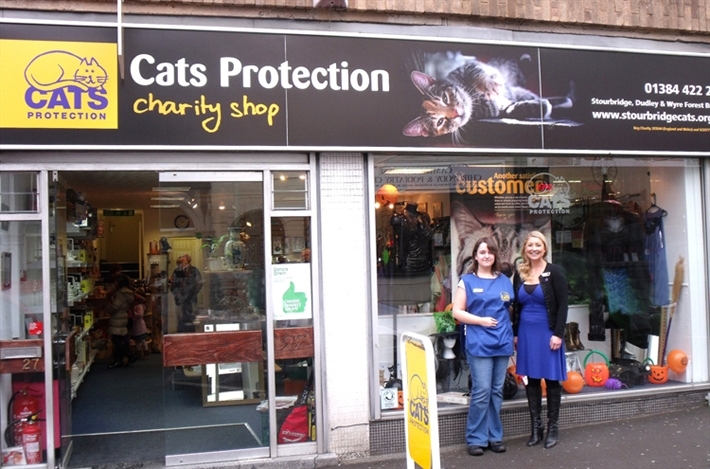 Cats Protection is a charity that relies on the generosity of the public and EVERY penny you spend in our shop will go towards food, accommodation and veterinary care for the cats we are trying to rehome. Claudine Danby is the ever-smiling, friendly face who manages the shop. She’s ably assisted by her team of 18 volunteers who ensure that items are clean and are presented in a professional way. If you’d like to help by volunteering in the shop, just let us know! No experience is required but volunteers usually work 3 hour shifts and need to be over 16 years old. For more details click on the ‘Volunteering’ tab at the top of the page. Donations of cat food are also most welcome so if your cat has got bored of a brand or has gone off ‘big tin’ cat food (sound familiar? ), we can help. It certainly won’t go to waste as we have plenty of cats who’ll love it! Monday – Saturday: 9am – 5pm.